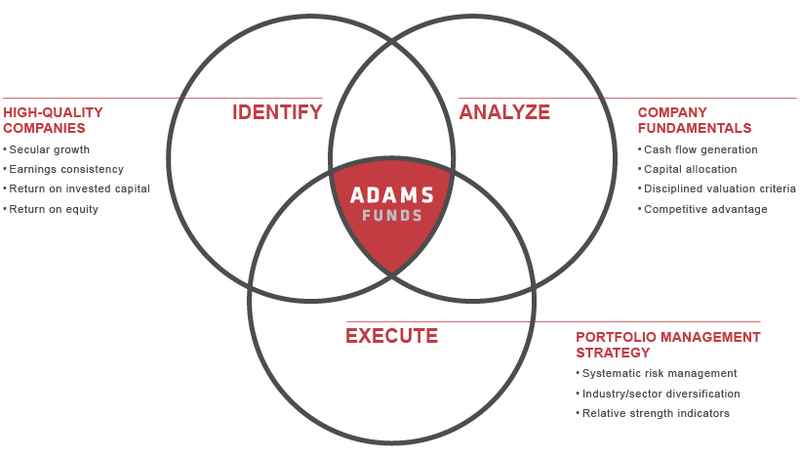 Since 1929, Adams Funds has been trusted by investors to help reach their investment goals. Our time-tested and disciplined investment process consists of three core tenets: Identifying high-quality companies through a proprietary research process; employing rigorous analysis to assess company fundamentals and executing a portfolio management strategy that focuses on generating long-term capital appreciation with careful attention to risk management. Our portfolio managers are supported by an in-house team of experienced research analysts who are intimately familiar with the sectors they cover. Investment decisions are made using multiple layers of analysis combining fundamental, bottom-up securities analysis with systematic evaluation tools to identify attractive investments. We pay careful attention to risk control measures in the portfolio construction process. This disciplined process is consistently applied across all market conditions.